Winter has now well and fully arrived, with its mercilessly harsh winds, hopelessly grey skies, and stubbornly low temperatures. 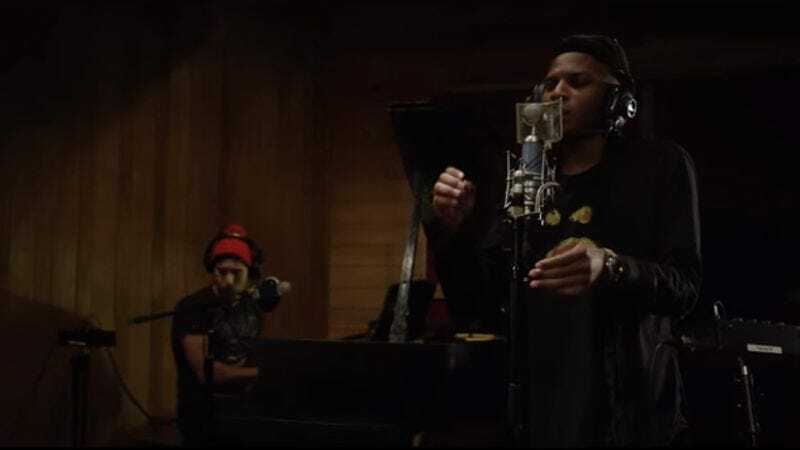 Those seeking a soundtrack to their seasonal affective disorder could do worse than “Blue Bucket Of Gold,” a musical collaboration between peripatetic indie musician Sufjan Stevens and alt-R&B up-and-comer Gallant. It’s a slow, achingly pretty piano ballad that’s just the right accompaniment for staring out the window with a longing expression and pondering death and decay. It’s also the basis for the first episode of what looks to be a new web series called In The Room. The track, available for streaming on Spotify, was indeed recorded in a room, specifically a New York recording studio back in December. It’s an intimate, unfussed-over performance, reputedly the song’s first and only take. The emotional highlight probably arrives when Gallant breaks out his formidable falsetto. Oh, the blue bucket is like the lost blue bucket of gold. It’s a, like, gold-mining myth. Yeah, these kids were playing in the gold rush out in some river in eastern Oregon, and they came back to the camp, and they had this bucket full of rock and sand and stuff. But then there was gold in it, so everyone wanted to know where the kids were playing, ‘cause they wanted to go find the gold. I mean, it was probably just a myth, and then the whole story just spread everywhere until everyone went crazy. And they were like, “We gotta find this lost goldmine!” But it didn’t exist.